Close to Pelican Waters shops. Close to beach. 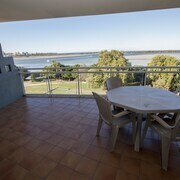 While we would have liked to be closer to Caloundra, we enjoyed our stay. Good food outlets at Golden Beach shopping centre. This is a very comfortable unit. the beds are comfortable and the kitchen well stocked although could do with a bit of an refresher. the view is great. there are a lot of units in the complex and the garage is tight for even my small car. Respite to sanity arrived warm out and sick. left sick days later ready to face life again. Great hotel and staff. Thank you We had a great time and would highly recommend this hotel. Close to shops, parks and beach. We love the stay and will definitely be back again. Sure, scrolling through your mates' travel posts is fun. But with such a brilliant range of accommodation options in Golden Beach, why not take a break and shoot your own #TravelEnvy masterpieces instead? Let’s be real — almost everyone wants to stay in the thick of the action. 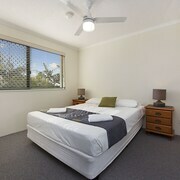 Lucky for you, there are 56 hotels within 5 kilometres of downtown Golden Beach on lastminute.com.au. 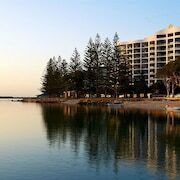 Don't get FOMO — be close to all the action at the Aspect Caloundra and the Rumba Beach Resort. If they don't jump off the page, the Sails Resort on Golden Beach and the Gemini Resort might be a better fit. The neighbourhood of Kings Beach lies 3 kilometres from the middle of Golden Beach, and has 17 hotel options. 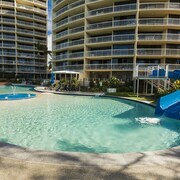 Be sure to check out the latest deals at the Rolling Surf Resort and ULTIQA Shearwater Resort. The colour, vibrancy and atmosphere of Caloundra Street Fair appeal to locals and tourists alike. If you're wanting to spend a night or two nearby, look into rooms at Monaco and Portobello By The Sea Simple as! Stretch your legs and take a walk along the shore at Bulcock Beach. You never know what you'll see. 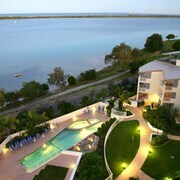 Pumicestone Blue and Fairseas Apartments are two good places to crash out if you don't want to stay far away. 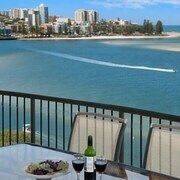 You may also like to try the Oceans Mooloolaba, which you'll find 16 kilometres away. Or perhaps the Spicers Tamarind Retreat, just a distance of 25 kilometres from Golden Beach. Some more alternatives are the Narrows Escape Rainforest Retreat, 30 kilometres away, and the Spicers Clovelly Estate, 25 kilometres away. Still haven't discovered the ideal room? You might just find a high enough thread count in Warana. You'll also be able to check out Shelly Beach and Moffat Beach. 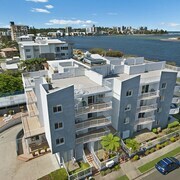 If you want to stay in Warana, look into the Raffles Mooloolaba and Sailport Mooloolaba Apartments. 12 kilometres to the north of Golden Beach you can also stay at Parrearra, which is home to the Bluewater Point Resort and Osprey Apartments. If you're staying in Parrearra, make sure you visit Dickey Beach and Point Cartwright. There's nothing worse than hitting the tarmac and wondering where on earth you're gonna crash that night. So why not sort it out before you leave and book a room at the Novotel Brisbane Airport? 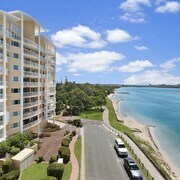 It's seriously close to Brisbane Airport, which lies 65 kilometres from Golden Beach's centre.